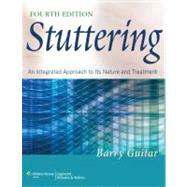 Stuttering is the most comprehensive core introductory textbook on the topic available today. The work sets itself apart from competitors by exploring a variety of practice settings and grounding all topics in a firm basis of the disorder's origin and nature rather than just providing clinical presentations. It is the most popular textbook for undergraduate stuttering/fluency disorders courses in Speech Pathology/Audiology programs and first year graduate stuttering/fluency disorders courses in Speech Pathology masters programs. This has been the definitive text for a number of years and through multiple editions. With a new edition that updates the science and addresses all current methodologies, this will continue to be the most successful and useful textbook on the subject.